Fireflies, forgotten for many years, reappear one summer evening. 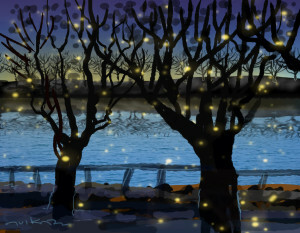 Shabbat, Riverside Park, along the Hudson. Under the shelter of tall trees, runners race by. Couples stroll, families with small children sprawl on the grass. The first flashes, as the sun drops low over New Jersey, catch me by surprise. Then the tears begin. It is like a dream. Niot’s look of pure delight and wonder when he sees fireflies for the first time. He is twelve years old, or perhaps ten. We are in Silver Spring, at my parents’ home. I am sitting in an armchair reading a newspaper. Twilight falls. Niot appears behind the frame of the large sliding glass door that separates the family room from the backyard. He catches my eye, then turns his gaze to the yard. Points of weightless brilliance as day slides into night. “Specks of living light / twinkling in the dark,” Tagore calls them. The picture is clear and present to me in the park at dusk, as clear as if I were again in that armchair and Niot beyond the sliding door. When Niot first began to appear in my dreams, he was far away, visible for an instant, then gone. I wept in my sleep. How could light make me cry? How could a creature showing itself to the world make me feel that world as empty? The firefly’s light is a cold light. It startles but it does not warm. Winged embers mark trails along the river, like comets flying close to the sun, tails aimed at me.